The Superman Fan Podcast: Episode #206: Superman Comic Books Cover Dated February 1960: Superman #135 & Action Comics #261! 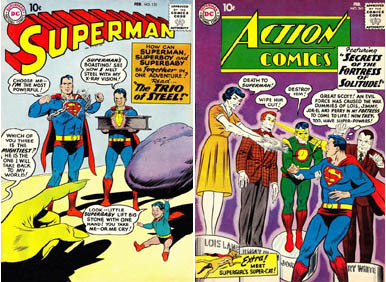 Episode #206: Superman Comic Books Cover Dated February 1960: Superman #135 & Action Comics #261! Superman #135 & Action Comics #261! This episode could also be called the Jerry Siegel Show, since he wrote all of the Superman stories, as well as the Supergirl tale. This is the first episode where that has been the case. These were his 8th - 12th silver age comic book stories. All of the Superman stories in this episode have been reprinted in SHOWCASE PRESENTS: SUPERMAN vol. II. SUPERMAN 135, February 1960, was published on December 17, 1959. It contained 32 pages for the cover price of 10¢. Mort Weisinger was the editor, and the cover was pencilled by Curt Swan and inked by Stan Kaye. - WHEN LOIS LANE FIRST SUSPECTED CLARK KENT WAS SUPERMAN (8 pgs. ), drawn by Al Plastino. This story carried the subtitle AN UNTOLD TALE OF SUPERMAN, the 7th Superman story to carry that subtitle. - SUPERMAN'S MERMAID SWEETHEART (10 pgs. ), pencilled by Wayne Boring and inked by Stan Kaye. - THE TRIO OF STEEL (8 pgs. ), drawn by Al Plastino. ACTION COMICS 261, February 1960, was published around December 31, 1959. It contained 32 pages for the cover price of a dime. Mort Weisinger was the editor, and the cover was pencilled by Curt Swan and inked by Stan Kaye. - SUPERMAN'S FORTRESS OF SOLITUDE (12 pgs. ), was pencilled by Wayne Boring and inked by Stan Kaye. - Congo Bill made his 13th appearance as Congorilla in CONGORILLA'S LAST STAND (7 pgs. ), written by Robert Bernstein and drawn by Howard Sherman. - Supergirl appeared in her 11th story, SUPERGIRL'S SUPER PETS (8 pgs. ), drawn by Jim Mooney. Her story has been reprinted in SUPERGIRL ARCHIVES vol. I and SHOWCASE PRESENTS: SUPERGIRL vol. I. Elsewhere in DC Comics, 31 titles carried the February or February/March 1960 cover dates. Next Episode: SUPERMAN FAMILY COMIC BOOK COVER DATED JANUARY/FEBRUARY 1956: WORLD'S FINEST COMICS 86! In 2 Weeks: SUPERMAN COMIC BOOK COVER DATED MARCH 1960: ACTION COMICS 262! It was announced this week that long time DC comic book writer Alvin Schwartz passed away on October 28, 2011. He wrote for DC during the 1940's and 1950's. After his comic book career, Schwartz was a novelist, poet and essayist. For more information: http://www.newsfromme.com/archives/2006_05_25.html#011552. The new home for THE SUPERMAN FAN PODCAST is http//thesupermanfanpodcast.blogspot.com. Send e-mail to supermanfanpodcast@gmail.com.